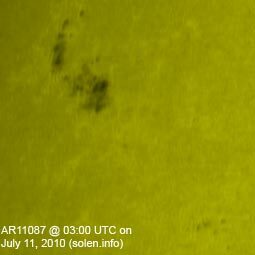 Last major update issued on July 11, 2010 at 04:55 UTC. The geomagnetic field was very quiet on July 10. Solar wind speed ranged between 270 and 352 km/s. Solar flux measured at 20h UTC on 2.8 GHz was 79.9. The planetary A index was 2 (STAR Ap - based on the mean of three hour interval ap indices: 1.8). Three hour interval K indices: 00000101 (planetary), 10001211 (Boulder). 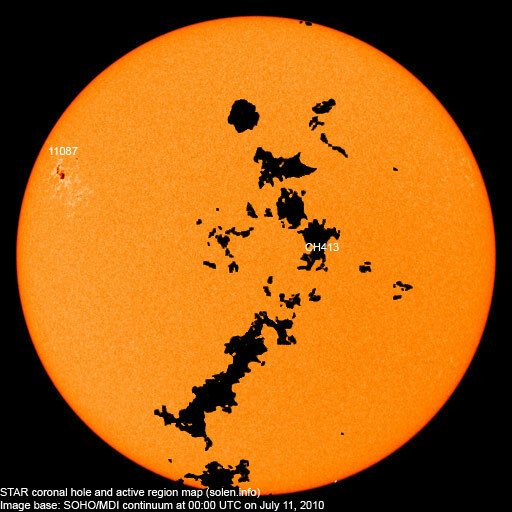 Region 11087 developed quickly adding many new spots. There's polarity intermixing in the northern part of the region. An M class flare, even a major one, is possible. July 8-10: No obviously Earth directed CMEs were seen in LASCO or STEREO images. 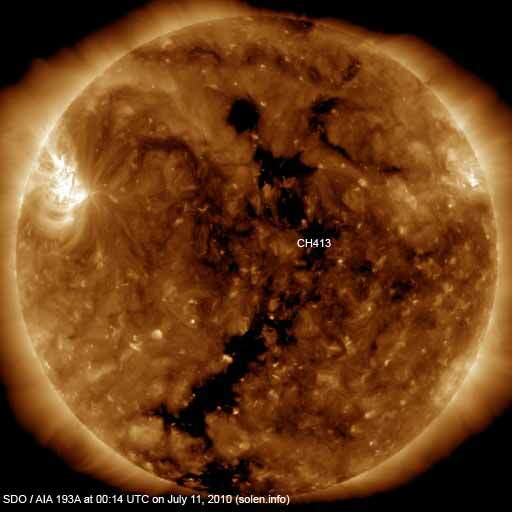 A recurrent trans equatorial hole (CH413) was in an Earth facing position on July 9-10. The geomagnetic field is expected to be quiet on July 11. A high speed stream from CH413 could cause quiet to active conditions on July 12-14. 2) Current impact on the monthly sunspot number based on the Boulder (NOAA/SWPC) sunspot number (accumulated daily sunspots / month days). 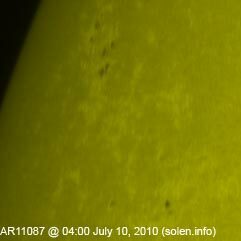 The official international sunspot number is typically 30-50% lower.